Hopefully of a better day in the future, Rick leads the assembled forces of Alexandria, the Hilltop, and the Kingdom to bring the fight to Negan by attacking the Sanctuary directly. The Alexandrian and Hilltop army makes a bloody raid on another of the Saviors' satellite stations, where Tara and Jesus clash over whether to allow any survivors. Meanwhile Ezekiel, Carol, and the Kingdom soldiers move through the woods in search of a fleeing enemy, and Rick encounters a familiar face. Rick finds himself face-to-face with a man he knew in the early days of the outbreak, while Aaron struggles with a wounded Eric. As Jesus and Morgan clash over how to deal with their prisoners, Maggie must decide whether to show mercy to a traitor. Cut down by the Saviors' powerful weapon, King Ezekiel finds himself alone and fighting to stay alive. Meanwhile Carol works to stop the Saviors from escaping and delivering the weapons to the Sanctuary. Father Gabriel finds himself trapped alone with Negan, who warns him that without his presence the Saviors' compound could descend into chaos. Rick and Daryl have a difference of opinion on how the fight against the Saviors should proceed. Rick attempts to forge a new alliance with an adversary, while Daryl and Tara make plans of their own for the Sanctuary. Maggie weighs what to do with Jesus' prisoners, and Carol faces a disheartened Ezekiel. And as Michonne and Rosita set out on a road trip, Carl approaches a lone survivor in the woods. As Daryl leads an attack to break through the Sanctuary's defenses, inside the compound Eugene reconsiders what sort of man he is and who he will side with. Elsewhere, Rick deals with the treachery of a former ally. Negan and the Saviors attempt to reassert their dominance over Alexandria, the Kingdom, and the Hilltop after escaping from their prison, leaving Carl in charge of saving the people of his town. Meanwhile Aaron and Enid make contact with Oceanside, and Dwight crosses the point of no return. With Alexandria under siege Rick and Michonne must come to terms with the fate of an ailing Carl. Meanwhile Carol and Morgan try to rescue Ezekiel from his fate at the hands of the Saviors. 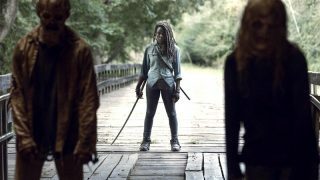 Still grieving a profound loss, Michonne and Rick leave Alexandria and turn toward the Heapsters -- only to fall into a trap. Negan and Simon debate the Saviors' next move, and Enid and Aaron must convince Oceanside to keep them alive. With Daryl leading the survivors on a dangerous trek to Hilltop Tara's vendetta against Dwight reaches the boiling point. Elsewhere Dr. Carson and an ailing Gabriel are forced to seek refuge, while at the Hilltop Maggie faces a food shortage and a crisis decision. With the Saviors approaching Hilltop Rick takes a rare chance to isolate Negan from his people and confront him face-to-face. While Simon tries to convince Dwight to turn on Negan, Maggie faces a difficult decision when a stranger offers Hillstop a trade. Maggie and the Hilltop community defend their home when Simon leads the Saviors in a nighttime attack. In the aftermath young Henry looks for revenge, and the house becomes the epicenter of an unexpected walker attack. Morgan and Carol go out looking for Henry and the escaped prisoners, while Michonne presses Rick to confront his grief. Jadis holds Negan prisoner, with a mysterious agenda. Simon and Dwight must tread lightly when Negan returns to the Sanctuary. Daryl and Rosita capture Eugene from his bullet factory, and Aaron continues his quest to bring Oceanside into the fight. Rick leads his people out for a final assault to end the Saviors, unaware that Negan has set a trap for them -- and that the enemy is rolling toward Alexandria. Gabriel makes a play for his freedom, and Jesus tries to convince Morgan that there is another way.